The first building in London to exceed the height of St Paul’s Cathedral, the 118 metre (387 foot) high Millbank Tower opened in 1963. Said to have been inspired by the works of Modernist German-American architect Mies van der , the 32 storey building, located on the river just south of Westminster, was designed by Ronald Ward and Partners. It was originally built as the headquarters of the engineering firm, the Vickers Group (hence its original moniker of Vickers Tower) and the Legal and General Assurance Society. 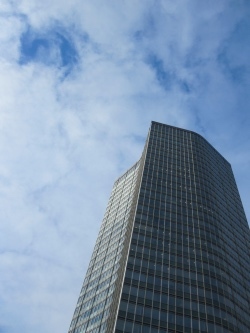 The glass walled building, which features a 31 storey tower atop a two storey podium, only held the title of London’s tallest building briefly – in 1965 it was overtaken by the Post Office Tower. Now Grade II-listed, it was famously the headquarters of the Labour Party between the mid-Nineties and early Noughties – it was from here that it ran its 1997 general election campaign which saw the election of Tony Blair to the office of Prime Minister. The Conservative Party has also been a tenant (although in this case of the complex to which the building is attached) as has the United Nations and numerous government agencies. The bulding has also appeared in episodes of Dr Who. The building was recently the subject of an application for it to be redeveloped into a hotel and luxury apartments.